I’ve seen a lot around lately about parents, especially mothers, judging each other. This one feels that one is judging her for feeding her children white bread. That one feels another is judging her for not buying organic. Another feels the other mothers judge her lack of designer fitness wear at school pick up. Yet one more feels judged for buying K-Mart sneakers for the kids. We Are All Judging Each Other. There are a thousand articles or possibly even more than that that urge us not to judge each other, that preach that mothers should support each other and so on. I agree with those- to a point. The thing is, we’re human and we all judge. All of us. If you tell me you never, ever judge other people I will tell you (once I finish laughing) that I don’t believe you. It’s human nature. We all do it. We don’t have any specific right not to be judged, despite what some might say. To me, the judging isn’t what matters. It’s what you do with that judgment. Some things we judge on are shallow and superficial in the extreme. I don’t judge anyone on the brand or style of their clothing. More often than not, I won’t know what brand it is anyway and if I do, it probably won’t mean all that much to me. But if I do see someone in a shocker of an outfit, there’s no need for me to make them feel bad about it. It’s my problem if I don’t like their outfit- not theirs. How we dress our kids, however, is something I hear and see a lot. Our lot tend to be hard on their clothes and shoes, so it would make sense to buy quality stuff. Or, it would, if they didn’t grow so damn fast. So $200 shoes make little sense. That’s my reasoning, anyway. I have had conversations with other school mums who worried that a child having the “wrong” brand of shoes (or bag or lunchbox or cap or whatever) might get teased for it. And it’s true, they might. Kids do tease each other about such things…if they’ve been raised by someone who loudly judges others based on their clothing. This is where what you do with your judgement matters. If you see kids in brands you don’t “approve” of, you are free to judge away. Why not tally up the amount that was spent versus the amount of money you suppose that family might have and work out what they may have spent the excess on. Tickets to the footy? New soft furnishings from Ikea? A blue-ray player? Once you’ve decided on what the parents most likely did with the $170 they saved on joggers by not buying the latest Nikes, why not judge them on that as well, even though you’re just guessing? Or on the flip side, imagine what some poor family is missing out on because they spent (in your estimation) far too much on shoes. No bread this week? Living off boiled rice? Whichever way you judge, the important step here is to contain it. There is nothing, NOTHING, to be gained by saying anything to anyone. Not your kids, not your other friends and certainly not to the other parent or anyone who might pass on your comments to that parent. Wear your judgy pants quietly; much like your leopard print g-string, no one else needs to know you have them on. When it comes to food, there are some super-judgy, sanctimonious people out there. This has, in turn, lead to some hyper-sensitivity from others. Food has become one of the most fraught areas in parenting lately and it’s getting a bit ridiculous. On one end of the scale we have parents who are literally terrified of processed or pre-packaged foods, extremely worried about chemicals in foods and terrified of refined sugars and conventionally farmed foods. Many have fallen for the idea that “natural” equates to safer or somehow superior, which simply isn’t the case. Those who are a bit more relaxed are loathe to admit to buying Tiny Teddies or muesli bars because then they have to hear about how apparently terrible they are. It’s to a point where someone sharing a healthy recipe might cop a mouthful for “judging”. This is the hypersensitivity I’m getting at; if I were to come up with a great, healthy slice recipe, that is not me sneering at your Tiny Teddies. I’m not judging you. What I cook is not a reflection of my feelings towards anyone except for the people I’m cooking for and not always then, either! Some nights, although I love them dearly, it’s eggs on toast for all and if they don’t like it, tough! Are you making a choice that is just simply different to mine? I buy wholemeal bread; you buy white. No judgement here. You buy expensive clothes; I like to buy second-hand. I can’t say if you’re judging me, but no, I’m not judging you. If you think your organic, GMO-free is superior to my conventionally farmed food, that’s okay, I’m still not really even judging you. I’m just disagreeing with you. I can even explain why without resorting to dodgy websites and David “Avocado” Wolfe memes to back me up. Even if I think you’re wrong, I can see your intentions are good and that you aren’t hurting anyone (with the exception of your own bank balance). 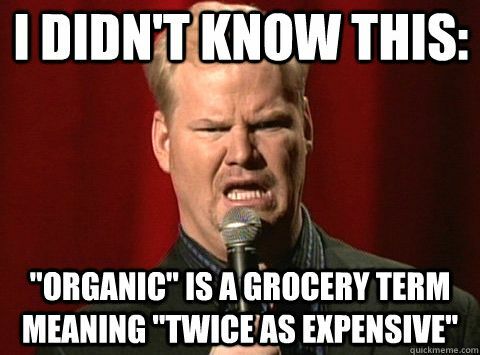 I actually buy some stuff organic but hot-damn, it ain’t cheap! However, if you are doing something that places your child, or anyone else, at risk of harm, I am judging you. I am judging you and I will say so. Because there comes a point when your feelings are no longer part of the equation and although I may not change your mind, I might help make up someone else’s. If someone chooses, despite the wealth of information out there, to give their baby home-made infant formula, I am judging them. It is dangerous, it can cause organ damage or even death. If someone chooses to drive a car with unrestrained children– I am judging them. They may be the best driver in the world but we cannot predict who else, or what else, may be on the road. I don’t care if it’s a 5 minute trip; there is no excuse. If you treat a sick child or a child in pain with something like homeopathy, I’m gonna call “Judging!” on that too, because no matter how many anecdotes you dig up to say it works, there are hundreds of ACTUAL studies that say otherwise and treating a child with a placebo is unethical, dangerous and has killed children before. Likewise, if you aren’t vaccinating your kids in the belief that vaccines are somehow bad, you are putting them and others at risk. Measles cases in Brunswick, Victoria. Is my judging you going to sway you either way? Probably not. But it is that very judgement that makes me vocal about things like this and if one person is teetering on the brink of an important parenting decision like vaccination etc, just call me Judgy McJudgerson, because I’ll do all I can to get them to see reason.